Animal Control-Wildlife, Inc. specializes in the humane capture of various indoor and outdoor nuisance animals and pests for both residential and commercial clients. 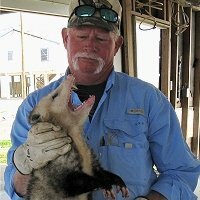 Drawing on over 30 years of experience, we provide Galveston and the Houston metropolitan area with exceptional animal and pest control services. Put your confidence in us for all of your animal control needs, we are licensed, insured and bonded by the State of Texas. As a family owned and operated company, we take great pride in providing outstanding customer service to each of our clients. Hal is a certified applicator licensed through the Structural Pest Control Service of the Texas Department of Agriculture. He was born and raised in Muleshoe, Texas where he started catching at age 7. Hal imported and exported wildlife during high school. His first out of country wildlife collecting trip to Nicaragua was when he was in high school. This was followed by trips to Central America and Mexico. Hal majored in Police Administration/Psychology and Physical Education in college. He worked at Sea Arama Marine World in Galveston, Texas from 1971 - 1975 as director of reptiles doing the oceanarian dive show, gator wrestling and snake handling show. He has been on That's Incredible three times, Incredible Sundays two times and multiple daily shows. He performed wildlife shows at Astroworld, Six Flags over Mid-America and Knotts Berry Farm in California. Hal started his first animal control business in the mid-70's doing strictly animal trapping and animal proofing. He received his certification from TEA to teach animal management in the mid 1980's as part of his animal control business. He sold the business in 1999 but remained active in wildlife work as a trapper of wild hogs, licensed nuisance alligator trapper, and breeder of wallabies. Hal also works with two game ranches, a gator farm and airboat ecological tours in Galveston Bay. In 2009, Hal decided to pursue his interest in an animal control business again by opening Animal Control-Wildlife, Inc.
D.J. is a certified applicator licensed through the Texas Structural Pest Control Service of the Texas Department of Agriculture. 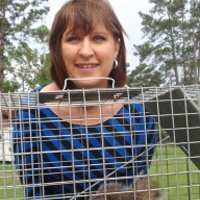 She manages the office, handles customer service, trains personnel and assists with trapping. In addition to working at Animal Control-Wildlife, D.J. has a background in banking and accounting in Amarillo, Texas and also works as a certified paralegal in the Conroe area. The contents of this webpage are Copyright © 2019 Animal Control Wildlife Inc. All Rights Reserved.